In order to more easily indicate the level of protection an electrical device’s housing provides against intrusion from foreign objects, dust, dirt and water, most manufacturers include an IP rating based on IEC standards for ingress protection. “IP" as used here stands for Ingress Protection, and the level of protection offered by a housing is denoted by two numbers which follow these letters, for example IP65. The two numbers following the letters IP denote the type of materials protected against and the degree of protection provided. In addition to protection against intrusion from foreign materials, these ratings also denote the level of protection for persons against potential hazards within the enclosure. For example, an enclosure which is rated to provide protection against the intrusion of large objects also prevents objects such as fingers from coming into contact with internal components which may hold dangerous voltages. IP ratings are based on international protection standards devised by the European International Electrical Commission or “IEC”. North America and Canada also provide ingress protection standards devised by the National Electrical Manufacturers Association or “NEMA”, and while these can be correlated to IEC standards, they address additional factors such as corrosion resistance, which makes direct comparison impractical. For general protection against internal contamination of enclosures, IEC standards are sufficient and widely used internationally, including in the North Americas although NEMA standards are usually predominant in the U.S.
Protection according to IP ratings is denoted by two digits, the first of which indicates protection against foreign bodies and solids such as fingers, dirt and dusts. The second number denotes the protection against water contamination and indicates not only protection against water but the degree of protection provided as well. Thus, an enclosure rated for protection against water and dusts may carry a label indication an IP65 protection rating, with the number 6 indicating that the enclosure is completely sealed against fine dusts, while the 5 indicates the enclosure can withstand being sprayed with water at low pressures. The first number indicating protection against foreign bodies is listed on a scale of 0 to 6, with 0 meaning no protection and 5 meaning the highest protection. The second number indicating protection against water is scaled from 0 to 8, with 0 meaning no protection and 8 meaning full submersion for a predetermined length of time specified by the manufacturer. The charts below outline the basics of IP ratings, what they mean, and how they are derived. Palm, Forearm, No protection against deliberate contact. Minor Dust Intrusion Allowed, Is Not Permitted to Interfere With Operation. Sealed against Solids. No Dust Can Enter. Full Protection. Some important considerations to keep in mind are that although an item may be rated as ”IP68”, this does not automatically infer the item can be safely operated at any depth for any period of time without failure. For IP68 ratings, manufacturers choose the specified depth which must be beyond 1 meter at which the enclosure will protect against the ingress of water. 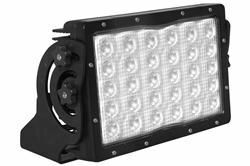 Normally, as with industrial lighting equipment or marine lighting intended to be operated for extended periods beyond depths of 1 meter, the manufacturer will include along with the IP rating a disclosure of the depths to which the equipment is approved. Also, for ratings of IP65 to IP67, it is not required that the enclosure be fully sealed or completely prevent water intrusion; only that if what should enter that it will not cause interference with operation or harmful effects. These international IEC ratings make it possible for manufacturers of electrical equipment to conform to easily understood standards that can be applied on a global level. This in turn allows the easy distribution and use of equipment from one region to the next without the need to meet overly disparate conformance standards from one region to the next. Additionally, such an easy and convenient standard allows consumers of such rated devices to easily and quickly determine the suitability of equipment to their specific needs and applications. IP ratings can normally be found on the back of equipment along with manufacturer serial numbers, manufacturing and operational data, and conformance approvals. Although IP ratings are an international standard, for North American equipment manufacturers it is often necessary to adhere to NEMA standards, in which case end users should refer to the relevant regulating bodies and literature for guidance.